This year, I picked a calendar we've never used before, one created by "More Time Moms." It's a compromise (no images at all), and its main selling point is a pocket at the back that can hold all our invitations, registrations, and other scraps of paper I used to paper clip to the calendar. What type of calendar(s) do you use? I have spent a lot of time reading this month, but not much time writing. Usually, the two literally go hand in hand as I hold a pen while paging through books, and jot down notes on nearby scraps of paper. But not always. "Are You There God? It's Me, Margaret"
"The Princess Bride" & "Adventures in the Screen Trade"
Gary and Colter and I went to see a fantastic display of holiday lights earlier this week, and on the way home, Colter asked: "Is Santa Claus Jewish?" Gary said he thought Santa was, because otherwise why would he work on Christmas? Merry Christmas, everyone, from my family to yours. I won't be the only one shopping for video games this holiday season. A survey of 7,300 consumers found that about one in five people will be buying them for boys. And a recent study (described in this article) found that gamers -- kids that grow up immersed in the world of video games -- are successfully preparing themselves for the working world they will enter as adults. I found this very reassuring. You can see the complete list of "hot toys" for girls and boys here. How many will you be buying? How's this for insight into marriage? Earlier this week, Gary said to me, "I know your happiness isn't my responsibility, but your misery is." We received this list of questions in a PTA newsletter and I found it fascinating. After realizing I only knew some of the answers, I had a long talk with Colter to discover the rest. Read it and see how well you know your child. Who is your child's best friend? What is your child's greatest fear? What are your child's favorite and least favorite subjects in school? What is your child's favorite television show? What color would your child like his room to be? Who is your child's greatest hero? Does your child feel liked by the children at school? What would be your child's favorite vacation? What is your child's favorite food, and what is the most dreaded? What is your child's most prized possession? What does your child feel is his greatest talent? What does your child like least about his looks? What does your child want to be when he grows up? What household chore does your child like least? What is your child's favorite family occasion? What nicknames do other children call your child? Of what accomplishment is your child most proud? What is your child's biggest complaint about the family? What is your child's favorite kind of music? What sport does your child most enjoy playing? 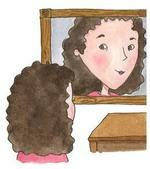 What would your child like to change about himself? What is your child's favorite outfit to wear? What embarrasses your child the most? What does your child like most and least about church, temple, etc.? Who -- outside the family -- has influenced your child the most? According to the PTA newsletter, if you answered 20-25 correctly, you talk with your child and know him well. If you answered 13-19 correctly, you know a lot about him but could improve. If you answered fewer than 13 correctly, you need to spend more time wtih your child and listen harder. I love transforming a dish from dirty to clean. I love the water on my hands, the soap on the sponge, the repetition of rubbing the plate or cup or silverware. It's simple and it's satisfying. And when I've emptied the sink, I feel like I've accomplished something. Plus, no one else wants to do it, so there's a certain virtue in getting my hands dirty. Did I mention our new house has no dishwasher? What household chore(s) -- if any -- do you find meditative? And yet I'm such a modern wife and mother. I work long hours and spend the time that's left with my family, even though they come first in my heart. This story started November 12, 1995. That's the day I got married. But since I was already pregnant with our son, I guess you could say it started a few months earlier. Actually, my husband and I lived together for several years before deciding to wed, and in fact, we would have waited, except that it was important to my future mother-in-law that we be married when our child was born. So, I had the gown fitted, the cake ordered, the bells ready to ring in this new era of our lives. But getting to the altar -- actually, in our case, the chuppah -- was complicated. Isn't it always? We couldn't find a rabbi who would perform the ceremony (I am Jewish, my husband is not). We couldn't find a location we liked that had an airport nearby so my parents could fly in easily from Chicago. We couldn't be sure I'd be able to take time off from a new job working at a TV station (our wedding date was during a ratings period, when no one is allowed vacation). Eventually, details were resolved, the anxiety passed, and we found ourselves standing side by side one sunny, startling Saturday morning. We were surrounded by siblings and friends, holding the canopy above us. Seated behind us were our families and more friends. I don't remember much about our wedding ceremony -- it only lasted 15 minutes, a half-hour maybe -- but I do remember the moment it ended. Gary and I walked down the aisle to the song "May you never" and began our lives as husband and wife. We were married. Those 15 wonderful minutes began the best nine years of my life, so far. I love my husband. More than ever. I love being married to him. I often find myself looking at my wedding band, the words engraved on my ring and on my days: "I carry your heart with me." Everywhere I go, you go, my dear. Don't misunderstand me. Gary and I have had problems -- overwhelming, challenging, debilitating problems at times: financial, emotional, geographical. We filed and survived bankruptcy; we are raising a very challenging child together; and we left an area we loved so that I could accept a job that would be better for all of us, even though it meant my husband would be farther from his parents and his own work. But our union has strengthened, just as it has strengthened us. It has boosted our immune system -- the more we are exposed to, the more we can fight off. It would be tempting fate to say there is nothing we could not survive together. And it is probably untrue. I have seen marriages destroyed by the death of a child, by selfishness, by disinterest. But there is nothing I want to go through without my husband. And nothing I want him to go through without me. Just this week, we moved into a new home. For the last two months, Gary has spent all of his time knocking through ceilings, exposing beams, eliminating and rebuilding walls, ripping out carpet, putting in hardwood floor, painting. He has been making us a home. He spilled blood and sweat (the tears were mine), and now, we live among boxes filled with toys, memories, hope. And a few wedding pictures.